There was a lot of important information on the U.S. economy released this week but the biggest data point is without a doubt the latest monthly job report from the Bureau of Labor Statistics (BLS) out this morning. 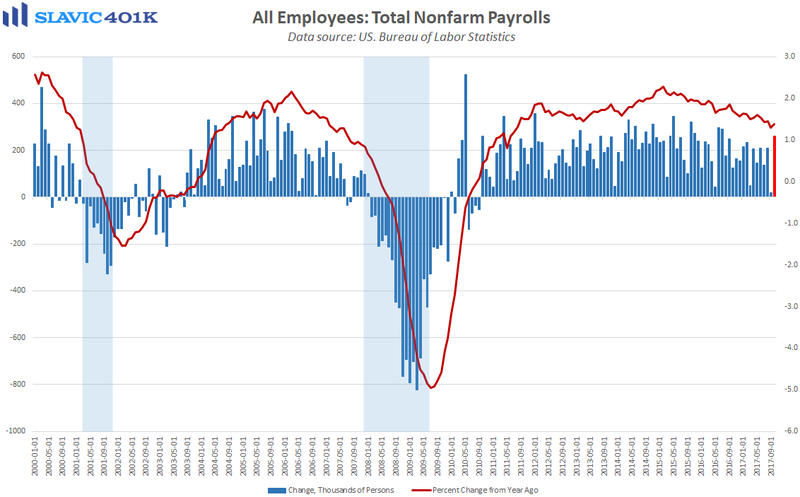 Indeed, total nonfarm employment in America rose by 261K payrolls in October, the largest monthly gain since July of last year but well below the expected 325K increase. There was a net upward revision of 90K payrolls to the August and September reports, which altogether resulted in an average rate of job growth of 162K during the past three months. That is near the bottom-end of the range for the past few years but still comfortably above Federal Reserve (Fed) officials’ estimates for what is needed to keep up with U.S. population growth. 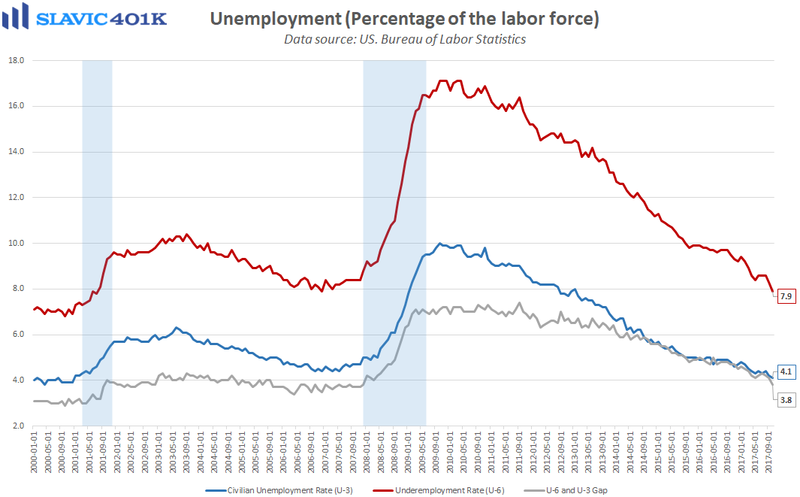 As for joblessness in America, the official unemployment rate (U-3) declined to 4.1 percent in October, and the underemployment rate (U-6) plunged to 7.9 percent, both the best readings in more than a decade. As for the negatives, the labor force participation rate fell last month to 62.7 percent, the worst print since May. 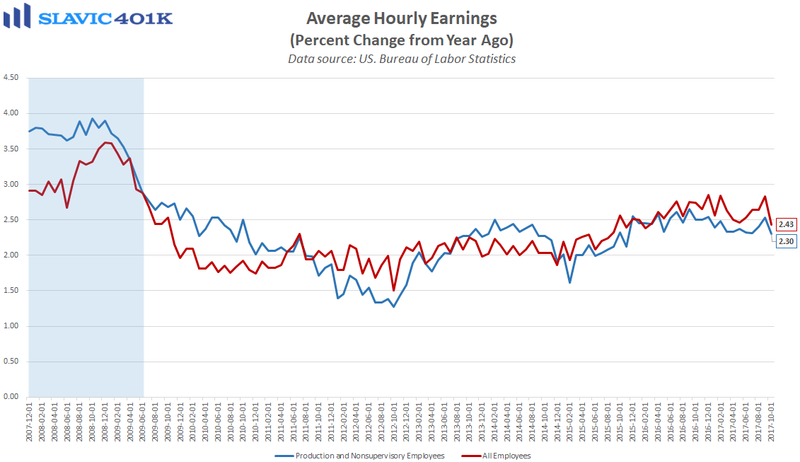 Further, average hourly earnings were unchanged in October, well below the 0.2 percent gain economists had anticipated and enough to pull the annual pace of wage growth down to just 2.4 percent. Overall this was a somewhat disappointing report but it seems likely that hurricanes Harvey and Irma continued to have an effect on the data, meaning that subsequent job reports will reveal more about the true health of the U.S. labor market. More importantly, initial jobless claims are a better leading economic indicator that continue to show no signs of an imminent recession, and the market-implied probability of another interest rate hike at the December Federal Open Market Committee (FOMC) meeting remains close to 100 percent.